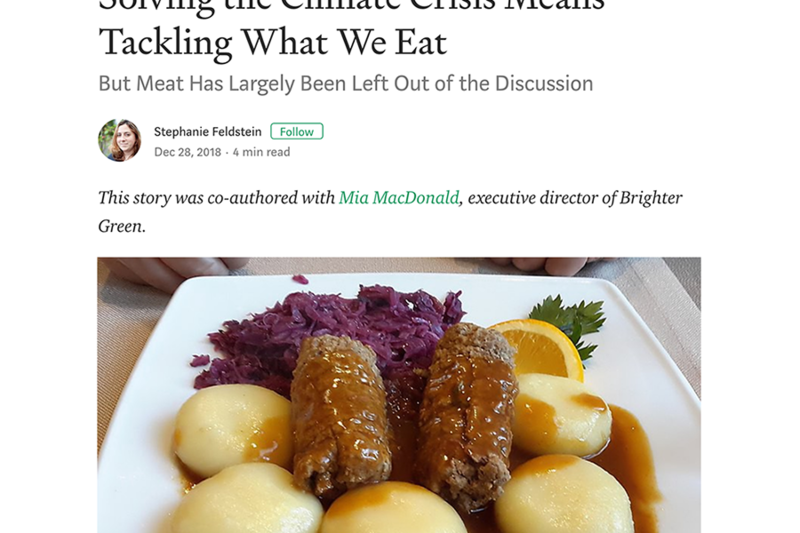 Executive Director, Mia MacDonald, and Stephanie Feldstein, the population and sustainability director at the Center for Biological Diversity, have written an op-ed together called “Solving the Climate Crisis Means Tackling What We Eat: But Meat Has Largely Been Left Out of the Discussion” in Medium. This op-ed uses the report, The Climate Cost of Food at COP24, that we published with the Center for Biological Diversity and Farm Forward to launch a discussion about how we need to address the role of food and animal agriculture in warming the global climate. “Policy makers claim that what people eat is a personal decision, not a political one. We are led to believe that what we eat, grow, and produce is determined by consumer demand as opposed to artificial price supports that encourage farmers and agribusinesses to produce more and more of fewer and fewer commodities to justify sunken costs.” The full article can be read here.